Not only is masking one of my favorite ways to unwind and pamper myself, it’s a great way to improve skin quickly. I use masks at least twice a week in my routine, depending on how much time I have. I have many masks in my collection, but I always love to try new masks for both the experience and the outcome of better skin appearance. I feel so empowered and excited when I read this mission; it really speaks to me! In high school and college, I was very depressed due to issues in my family. With a negative outlook of myself, I felt threatened by other women, as if I was always in competition with them. As I’ve grown, I’ve realized that this former attitude was a major problem and it made me more miserable. Discovering beauty products has impacted me greatly, from viewing myself in a more positive light to being able to connect with other women as peers, instead of enemies or frenemies. I still have “bad days” and revert to negative feelings, but I’ve come a long way and can (usually) accept that I’m not perfect. One of my goals in life is to find a way to spread good vibes and help others to find happiness and acceptance. Sorry for the aside! Let’s get back on topic. 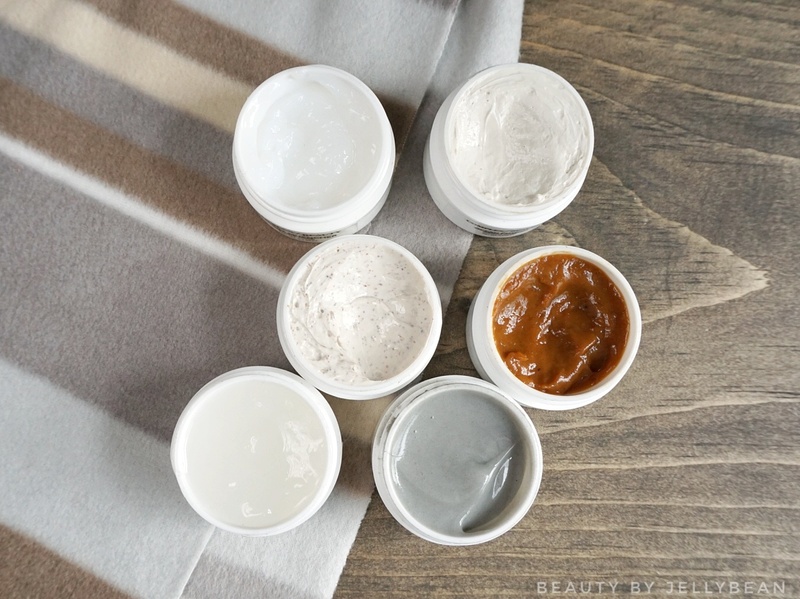 Complex Beauty has six different facial masks, plus a facial mist and a lip mask. I’ve tried their six different facial masks and quite enjoyed them. This mask uses activated charcoal to clarify skin, as it helps remove dirt from pores for a tighter appearance and less blemishes. Charcoal masks can be quite drying, especially with my dry skin. However, Baby Face also contains Hyaluronic acid for moisture and Aloe for soothing, so my skin doesn’t feel tight and dry after use. This mask also uses DMAE for brightened and lifted skin, Niacinamide to lighten dark spots, and antioxidant-rich Rooibos tea. Instructions say to leave it on for 15-20 minutes; in that time, the runny grey mask dries down, but not to an overly tight, uncomfortable finish. There is a little bit of an alcohol scent, though it dissipates as the mask dries. My skin looks brighter and my pores a bit smaller after use. I like to use masks like this when I’ve had a breakout to help clean up any pimples and make my skin look more clear, but I haven’t had the opportunity to put this mask up against a breakout yet. The Godmother is one of my favorite masks from Complex. It smells and looks deliciously like pumpkin. 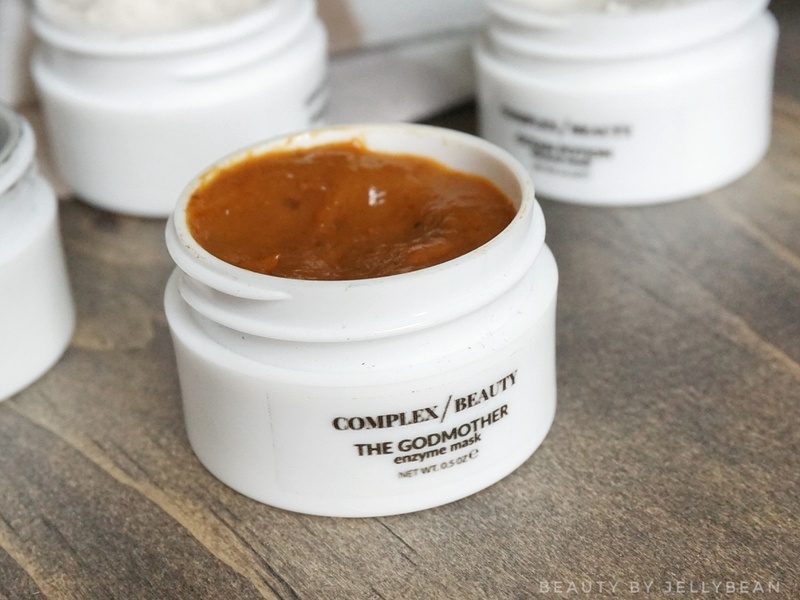 Pumpkin is a beautiful skincare ingredient; it’s full of antioxidants and AHAs that brighten, smooth, and soothe skin. On top of the power-packed pumpkin, this mask contains glycolic acid (another AHA) to exfoliate skin and Vitamin C for brightening and general antiaging. Complex warns that this mask may not be suitable for sensitive skin types due to the AHAs, and recommends 10-15 minutes of wear. 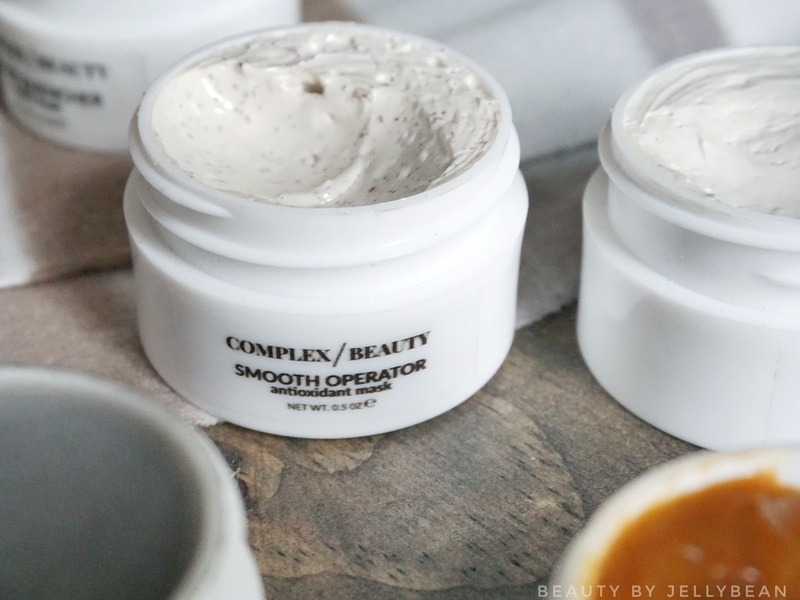 My skin loves AHAs, so I had no problems with this mask. It felt nice on my skin and, best of all, left me with soft, bright, clear skin. I enjoyed every moment using this mask! Filled with oceanic ingredients with healing properties, this mask is designed for skin in an overall state of disrepair. Kelp, MSM (methylsulfonylmethane), and Safflower Seed Oil have anti-inflammatory properties to protect and nourish skin, while Spirulina and Irish Moss are rich in antioxidants for antiaging. 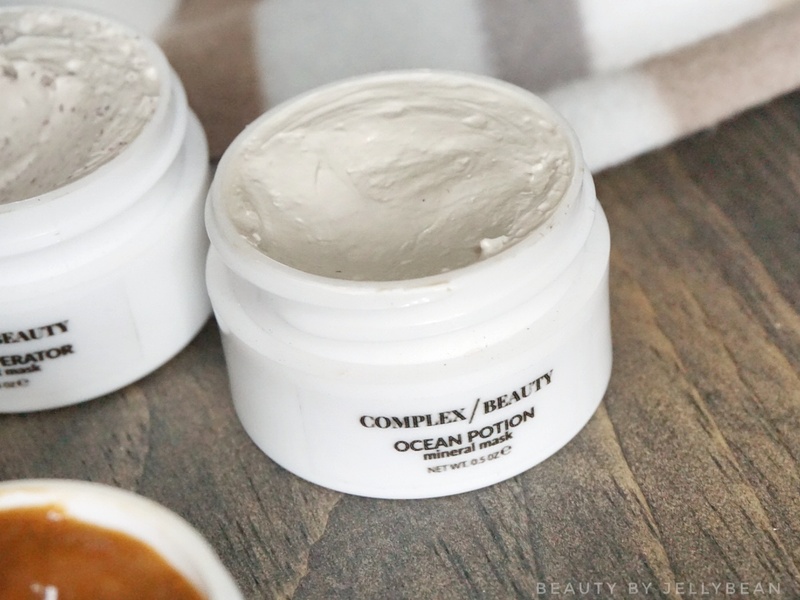 Ocean Potion is a creamy white mask that spreads easily and dries down within a few minutes. Rinsing off after 15 minutes, I had very smooth skin that felt neither dry nor hydrated. Overall, I don’t think this mask was anything “special,” but it wasn’t bad. This mask utilizes Rosewater for hydration along with Glycolic acid for exfoliation to promote glowing skin. 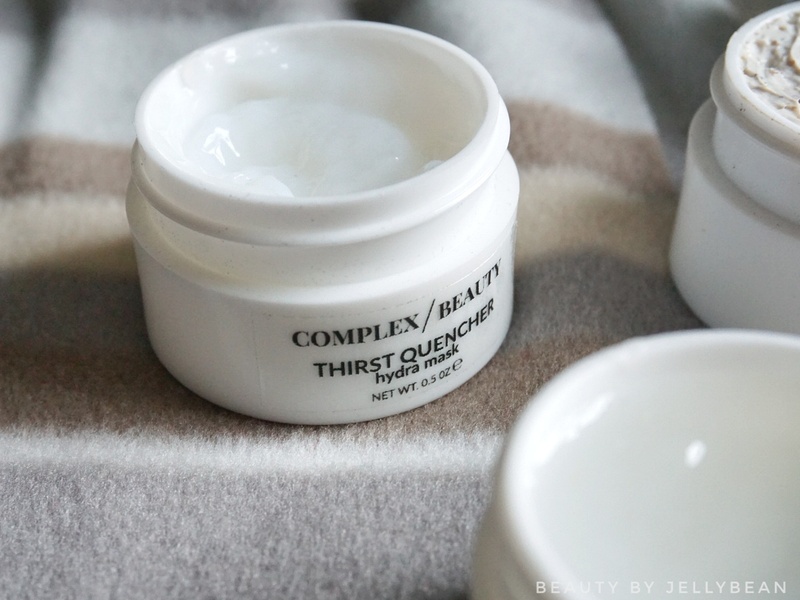 The jelly texture feels wonderful on my skin, but is very hard to pick up and apply. Again, this mask contains an AHA, so Complex delivers a warning for sensitive skin types. It’s a quicker mask in general – only 5-10 minutes is necessary for this mask to do its magic. 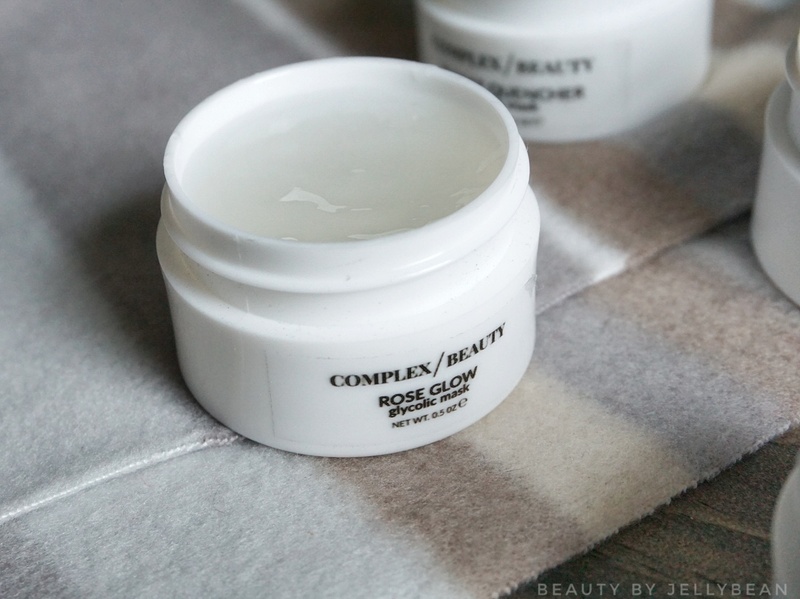 My skin feels soft and bright in just 5 minutes with the delicious scent of roses. I love the concept of this mask and really enjoyed using it, with the exception of the application part, as it’s a bit difficult to apply and spread. Packed full of antioxidants, this mask is great for general skin health. 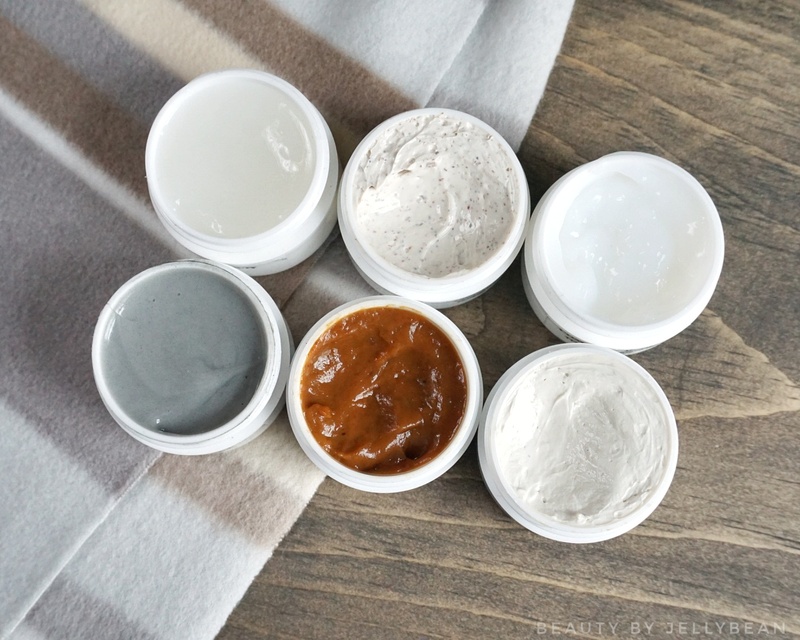 Squalane is one of my favorite antioxidants, as it helps skin retain moisture. There are small beads and exfoliating ingredients (AHAs Glycolic acid and Lactic acid) to really smooth skin. This one carries a sensitive skin warning as well. I did notice tingling just after application, though it didn’t last the full 15 minutes in which I wore the mask. Results were super soft, smooth, exfoliated skin. I’ve been timid to try this mask again due to the tingling, even though I love the results. With Hyaluronic acid, Aloe, and Oat, this mask is a hydration hero. The gel texture is much easier to apply than Rose Glow, but smells a bit minty. I really love this mask! After 15 minutes, my skin is super hydrated and soft. I did have some trouble trying to remove it with just my hands; I needed a washcloth to help me remove it. This is fine by me, as a washcloth can give a little bit of manual exfoliation. Out of the 6 masks, my favorites are The Godmother, Rose Glow, and Thirst Quencher. Rose Glow has a few issues, but I love a quick mask that feels nice when I want a little boost. I do enjoy Baby Face as well, though I will need to see how it works when I have a blemish I want to clear up. I’ll also have to try Smooth Operator again, though I won’t be reaching for it if I sense the tingling. 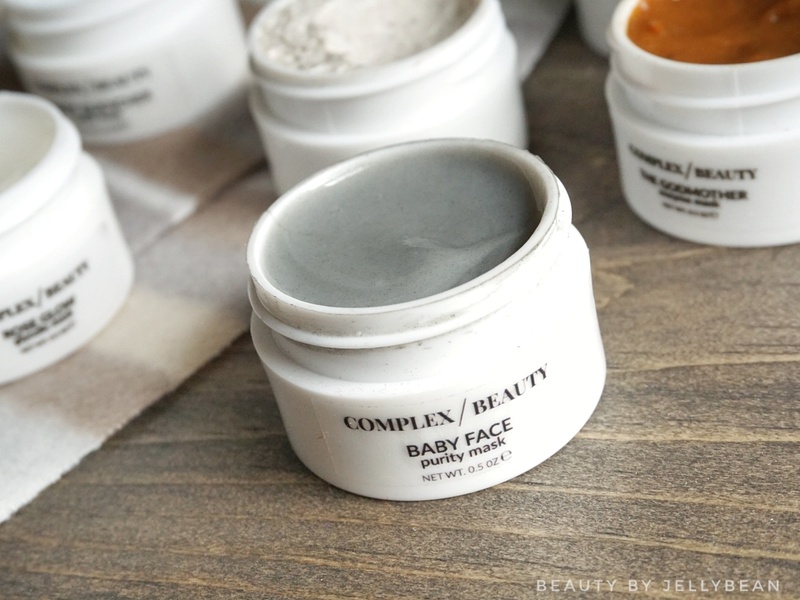 You can purchase these masks individually ($35/1.7 oz) from the Complex Beauty site. They also sell the Discovery Set ($55, 6 masks x 0.5 oz each), which is what I’ve reviewed here. I’m curious about their facial mist and lip mask, so I’ll be looking to try those in the future!